Varanasi District; Chiraigaon, Cholapur Block; Shankarpur, Chandpur, Dharsauna, Jagdishpur village. 150 bigha (a bigha is a little over 2500 sq. 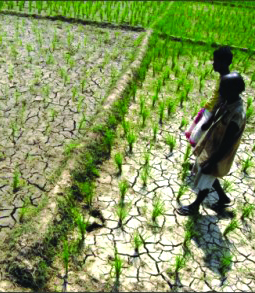 meters) of paddy cultivation has wilted in the absence of rain in Shankarpur and Chandpur villages. The fields are terribly dry. The crop cannot be planted without water. 1. Use of sprinklers instead of pumping sets. This uses 1/100th the water and also irrigates more area with less water. Half of the water that fills the fields with the pumping sets gets lost through evaporation. 2. Storage of water in the fields by constructing bunds. The water should not be allowed to run off. 3. When rain water collects on the roof, it should be directed into the ground through pipes. This is called rainwater harvesting.